Doing laser hair removal over dark skin is known to be dangerous. People with black skin or even dark brown skin, could not do laser or IPL treatments at home. Their only option was to attend a professional laser clinic, where the hair was removed (together with thousands of dollars from their back account). But people with caramel color skin are not in that category nor are they in the Caucasian category either. Being somewhere in between have made their decisions more complicated. IPL (or laser) hair removal works by pulsing intense light energy at the skin, there the dark pigment in the hair absorbs the energy and turn it to heat. The problem for people with ‘caramel’ skin color, is that when they treat the skin with IPL (or laser) the pigment in their skin absorbs the light energy and the skin tissue heats, which cause cause side effects like discoloration or pigmentation. For this reason ALL the hair removal systems approved by the FDA for home use, have a skin tone sensor, which checks the skin tone before each pulse. If the skin is too dark, the sensor locks the device from flashing. 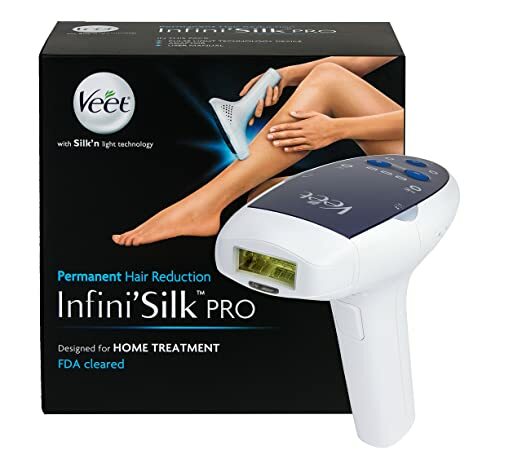 Below you can see the skin tone charts for ALL the light based hair removal systems: TRIA laser, Remington IPL, Philips Lumea IPL, Veet InfiniSilk IPL, Silk’n Flash & Go and any other IPL you may find at Amazon. As you can see, they are all not safe for really dark skin types 5+6. But many people have a type 4 skin which is a light brown caramel color. For them the IPL and laser can be used. Since the light brown or beige color are at the edge of the safety chart for IPL and laser, one must note that lower energy settings MUST be used when treating such skin tones. All of the systems have an 3-5 energy level settings. When treating beige skin, or light brown skin, a lower level should be used to prevent pain and skin damage. Lower level means less effective treatments. If you read the user manual you will see the reduction rate for beige or light brown skin is about 50%-60%. When using the higher settings the user manual expects a 60%-75% reduction depending on the body area. There is only one technology which is approved for dark skin hair removal. The ELOS is approved by the FDA for dark skin treatments. Caramel color which is at the edge of the chart for IPL is in the middle of the scale for ELOS. The ELOS use IPL + RF radio frequency. With a soft IPL flash followed by a RF wave. The RF wave is not a light energy wave, so it does not affect the dark skin at all. People with dark skin may need more treatments and more patience until they see effective results. But for those who keep the treatment schedule as planned, can get their body hair reduced. As more treatments required, if you have beige skin you may need multiple sessions. Check how many pulses you get with each device you plan to purchase. Most of IPL systems have 5000 pulses, which will be enough for 4-5 treatments. For dark skin you will probably need more, so get another replacement cartridge. The new ELOS systems have between 100,000-200,000 flashes! Which is enough for several years of maintenance, follow up treatments, and touch up sessions. The best offer is the Me my ELOS Pro Ultra Touch, with 150,000 pulses + 3 accessories. Which include a shave an epilator and a facial adapter. It’s a great relief that people with darker skin tones do not have to go to professional clinics to get their hair reduced. People with caramel colored skin, can chose whether to use IPL or ELOS. In both cases some patience needs to be considered, and more sessions done compared to the marketing promises before effective results can be seen. This entry was posted in IPL Hair Removal, Laser Hair Removal News, Laser Safety, Safe Removal Systems, Skin Discoloration and tagged Black skin hair removal, Does Laser Hair Removal Work on Black People, laser hair removal on dark skin, laser hair removal safety, Me my Elos Hair Removal, Me My ELOS Pro Ultra Hair Removal Review by admin. Bookmark the permalink.